Photo credit: Adapted by WhoWhatWhy from Brooksbank / Wikimedia (CC BY-SA 4.0), CIA / Wikimedia, Heinz Behling / Wikimedia and WhoKilledJFK.net. 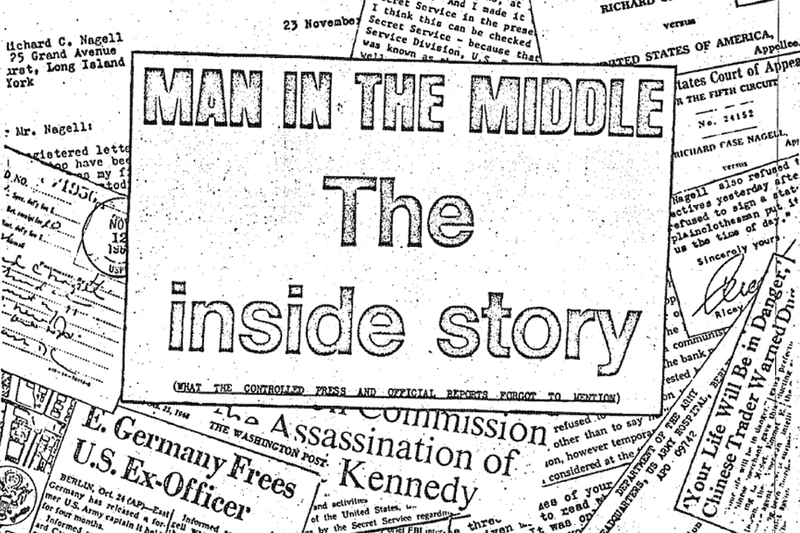 In Part 1 of this series, we told how Richard Case Nagell, a man who knew Lee Harvey Oswald and had apparent connections to intelligence, mysteriously walked into a bank, shot two holes into a wall, and awaited arrest — months before the assassination of President John F. Kennedy. Here, in Part 2, we pick up after he is released from US prison and decides to travel to East Germany — all the while under the close watch of the CIA. That a convicted felon happened to be abruptly released from a United States federal penitentiary at the height of the Cold War and ended up two months later being arrested on a train going through then-Communist East Germany is strange enough. That this same man had publicly claimed advance knowledge of the Kennedy assassination while imprisoned makes his saga even more tantalizing. The contents of newly released CIA files cited in part one of this story lend credence to Richard Case Nagell’s purported involvement with espionage and relationship with Lee Harvey Oswald. Here we will examine the CIA’s ongoing interest in Nagell — along with its strong concerns about what he might choose to reveal — in documents pertaining to his travels overseas in the late 1960s. The January 1968 edition of Ramparts magazine marked the first national awareness of the Nagell story. In a lengthy outline of New Orleans District Attorney Jim Garrison’s probe into the assassination, author William Turner cited a registered letter that Nagell alleged he’d dispatched to FBI Director J. Edgar Hoover. This had occurred shortly before Nagell’s intentionally getting himself arrested outside an El Paso bank on September 20, 1963. The letter was said to have warned Hoover of an upcoming attempt on President John F. Kennedy’s life. The cable concludes that Nagell “appears psychotic, possibly dangerous” — an allegation that persists throughout the new document trail. Yet if Nagell was really so easily dismissed, why was another CIA cable out of Europe (June 7, 1968) dispatched to a number of CIA officials in Washington, including several connected to Counterintelligence (CI)? The CIA maintains what are designated “201 files” on “subjects of extensive reporting and CI investigation” and on “prospective agents and sources,” according to the Agency’s Clandestine Services Handbook. Nagell’s is listed as 201-746537. (Oswald had one too, 201-289248). However, the CIA cable with Nagell’s 201 number asserts: “No indication Nagell involved in espionage, Communist Party, or Fair Play for Cuba Committee activity.” This was despite the CIA’s Office of Security having earlier pored over Nagell’s notebook — seized at the time of his 1963 arrest in El Paso — listing at least six of its employees, as well as alleged communists and Fair Play for Cuba officers. This particular cable had originally been released from the National Archives in 1998. But the current release no longer contains a cover note that appeared at that time. With signature deleted, the cover note stated: “Saw Jane Roman at 1615 hours on this cable. Original copy passed [to] her which she will use to prepare blind memo to FBI [on] this topic.” Jane Roman was the Counterintelligence Liaison under branch chief James Angleton who, in October 1963, had signed off on a CIA cable about Oswald’s alleged trip to Mexico City — which she admitted years later to a journalist she knew was inaccurate (Morley, 2017, p. 137-138). Why was Roman now in the loop on Nagell and keeping the FBI apprised of what he was up to? Bruce Solie was the CIA security officer who had prepared numerous internal reports related to the assassination. He was also the man who had conducted an investigation in 1968 concluding that Yuri Nosenko was a bonafide defector, after the KGB officer had come to the CIA not long after the assassination bearing what purported to be the Soviets’ intelligence file on Oswald. Also listed among the Nagell memo’s recipients was the last name “Murphy,” likely to have been David Murphy, the CIA officer in the Soviet Russia Division with overall responsibility for Nosenko’s interrogation between 1964 and 1967. The State Department telegram about Nagell concerned a conference between a CIA-connected lawyer from Washington named Ricey New, and Wolfgang Vogel — East Germany’s negotiator for high-level prisoner exchanges (including the renowned spy trade of downed U-2 pilot Francis Gary Powers for Rudolf Abel in 1962). 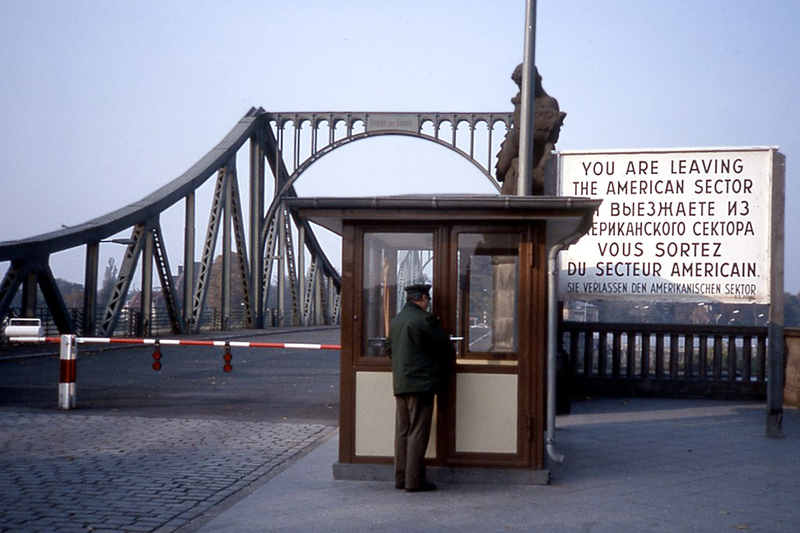 The conference established the schedule for Nagell to be released at a Berlin Wall crossing point. The telegram quotes Vogel as saying: “The release will be unconditional as an expression of goodwill.” It concludes: “NO RPT [repeat] NO PRESS STATEMENT WILL BE ISSUED BY MISSION.” Somebody wanted Nagell’s situation kept well out of the public eye. After Nagell’s release to US officials, a follow-up State Department airgram described Army psychiatrist George Babineau’s interview with Nagell on October 24, 1968. The new files don’t clear up who in the CIA might have been privy to such knowledge. What they do reveal is that, after returning to the US for a few months, Nagell showed up at the Consulate General’s office in Barcelona (February 28, 1969). He had not seen his ex-wife and two children since before his 1963 arrest, and now Nagell is said to have declared that if the State Department “did not fulfill its promise to find” them, he was going to “reveal the whole story about the assassination of President Kennedy to the press.” This document went to numerous CIA offices including CI/OPS [Counterintelligence Operations], as well as to LNERGO [the CIA’s code word for the FBI]. The next newly released file on Nagell is a CIA “transmittal slip” to “Mr. Murphy” — probably David Murphy of the Soviet Russia Division — dated October 6, 1969. It says cryptically: “File on Richard Case Nagell, #264 170, is permanent to Sarah Hall. This is a James Garrison case.” (Sarah Hall was part of the Office of Security). The last file, dated March 31, 1970, is a CIA Routing and Record Sheet whose author’s name is excised. In the margin is written: “This should probably be reclassified to Oswald’s 201 and only x-ref’d to MHORDEP” [a CIA program cryptonym]. Attached is a second Routing and Record Sheet that went to a dozen different people, including in Angleton’s office (CI/SIG) and WH/Cuba/Ops (the Western Hemisphere Division). What we can glean from all this is obviously incomplete, although it leaves no doubt as to continuing interest in Nagell at high levels of the CIA. That might be seen as expected, given Nagell’s disappearance in East Germany and subsequent threats to release information made at various US diplomatic offices abroad. 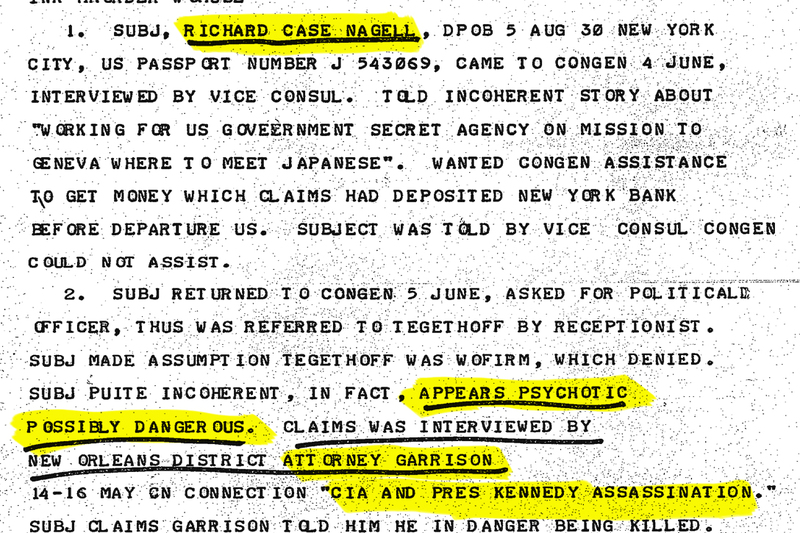 Yet the CIA file references to Garrison — and Oswald — indicate much more than passing concern. 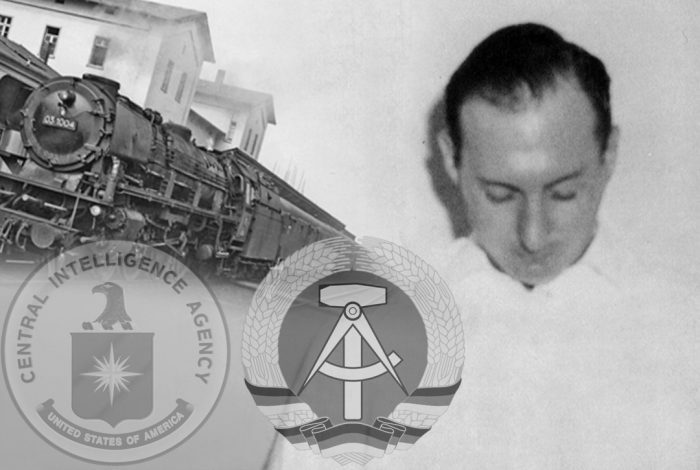 We now see that individuals long involved in the CIA’s Oswald paper trail — including Jane Roman, Bruce Solie, and David Murphy — overlapped with that of the Nagell saga. At a minimum, the Agency wanted to keep up with where he was and what he might be saying to whom. Nagell is no longer around to confirm or deny what’s in these files. He was found dead in his Los Angeles apartment in November 1995, after an alleged heart attack at 65. That happened to be the same day that a subpoena from the Assassination Records Review Board arrived at his post office box, requesting his testimony and his papers. Those papers have never surfaced. Related front page panorama photo credit: Adapted by WhoWhatWhy from book cover (Carroll & Graf) and cell block (US Army).